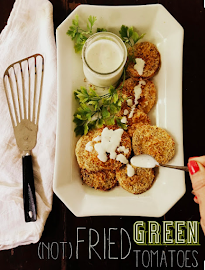 A healthier version of the South's favorite starter, these (Not) Fried Green Tomatoes are the perfect solution for those not-ripe beauties that fall off in a rainstorm, or perhaps when you get a little too antsy waiting for that coming tomato harvest. Farmers and gardeners in the South know a thing or 10 about growing tomatoes. Once daytime temps reach 90 degrees, tomatoes will cease to flower, so tomato plants are set out the very first days after the last frost is expected, and sometimes earlier, relying on crossed fingers, the help of hothouses, and upturned milk cartons to protect the plants in case of a late frost. I've strung large bulb Christmas lights from the house, extension cord connected to extension cord connected to light string and strung down the rows close to the base of the plant, then plant and bulb covered with opaque overturned jugs. From the road, it looked as if miniature alien spaceships had taken over the tomato plot. Plantings and harvests are staggered every few weeks, so as not to overwhelm the market, or the preserving farmer, as was my case. It's all over midsummer or so for the first tomato season in the South. As the mercury stretches toward 100 degrees, rangy plants produce little, and it's time to pull them to give room for more heat-friendly options, or to plant a quick cover crop-- but quick it must be for there are only weeks until time for the late summer planting seasoning. It sounds like a lot of work, and some complicated timing, and of course it is, but dang it, we get 2 seasons of fresh tomatoes down here and I can't think of a reward more precious for which to work. I've got a thing for tomatoes, for sure. 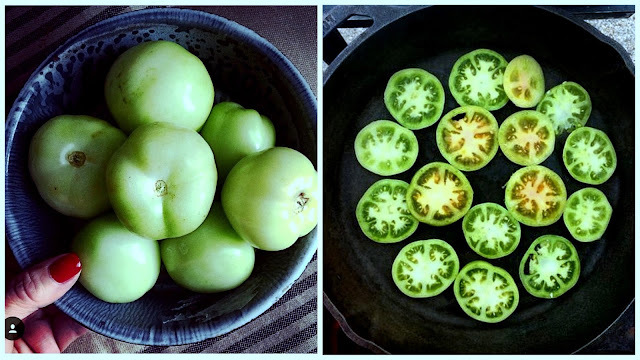 Right now, you'll find green tomatoes all around the country, and in many parts, the beginnings of salmon, pink, blush, orange, then RIPE. I love them all-- all colors and all stages from the tartest green to the deepest purples and black-reds, and I use them and preserve them in many ways. For that deep dark Cherokee tomato, it's Hellmann's mayonaisse, a Noonday onion slice, and homemade sourdough. For a year's worth of sauce, it's the bell-shaped, scant-seeded Roma. For tarts, tartines, gallettes-- heirlooms of every shape, size, color and variety. For the explosion of cherry tomatoes, a bowl on the table all day long-- they get snacked on often with a flourish-- tossed in the air and caught by my mouth. It keeps me agile. 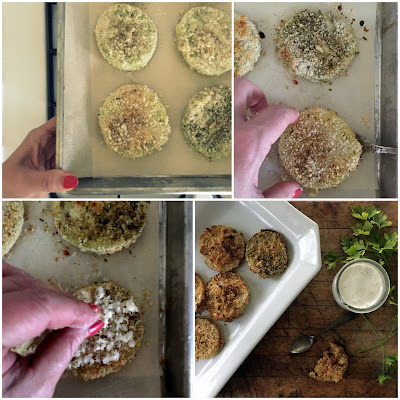 Occasionally, I'll make a batch of fermented green tomato pickles or charred green tomato chow chow, but only occasionally because my one true love of green tomato prep is the darling of the Southern menu, Fried Green Tomatoes. Only Not. I mean they're still green tomatoes, they're just not fried. But DANG, they're still as good. Better, I might say. Better because they're easier. Better because they're tidier. Better because I'm inclined to make a custom-sized batch for one, where I might not bother with the traditional preparation. Better because taking a spin in the oven instead of a dunk in the fryer means less mess, less fat, and better flavor, I think. The delicate herbs in the breading, the layers of flavor in the tomato are all showcased best without having been drowned by hot grease. Save the bacon drippings for another day-- and enjoy this quick, wholesome option. Line a sheet pan with parchment paper. While silicone spray or a mat will suffice in a pinch, I've found parchment to work the best, without losing any coating, and clean up is a breeze, for extra benefit. With a sharp knife, slice stem and blossom end of tomatoes and discard. Slice remaining tomato in 1/3" slices, approximately. Place in a single layer on a paper towel-lined plate or sheet pan, sprinkle each slice with salt, and set aside for 10 minutes. Whisk whole eggs, cracked, with 2 tablespoons tepid water in a bowl large enough to accommodate one flat slice. Combine fine seasoned bread crumbs, Panko crumbs, and 1/2 cup grated Parmigiano Reggiano cheese in a larger bowl (see note, below, regarding bread crumbs). You'll need a little room to bread them well on each side. Pat dry tomato slices. Transfer one by one to 1) egg wash, dipping each side in then, 2) transfer to breading, coating each side (use your fingers of one hand for egg, and other hand for breading, and you won't get all goopy like I did), then 3) transfer to parchment-lined sheet pan. Dribble tops with a few scant drops of freshly-squeezed lemon juice. Place pan in middle rack of preheated oven for 20 minutes. Remove, gently invert each slice, top with a scattering of Parmigiano Reggiano, and return to oven for 10-20 minutes, or until golden brown, and fork-tender. Season with freshly ground black pepper and sea salt, as necessary. Allow to cool slightly (the interior flesh can be napalm-hot when first removed from the oven), about 5 minutes, then serve. I like mine drizzled with this Homemade Southern Buttermilk Dressing. LOTS of folks do. But these are equally as intriguing served with warmed marinara sauce, topped with a dreamy, creamy seafood imperial sauce, or even in their nekkids. About seasoned bread crumbs: The bread crumbs I used for this dish were homemade, from a day-old loaf of Asiago Lemon Thyme foccacia I baked that was ground finely in a food processor. The bread was enriched with lemon infused olive oil, minced parsley, and fresh thyme. 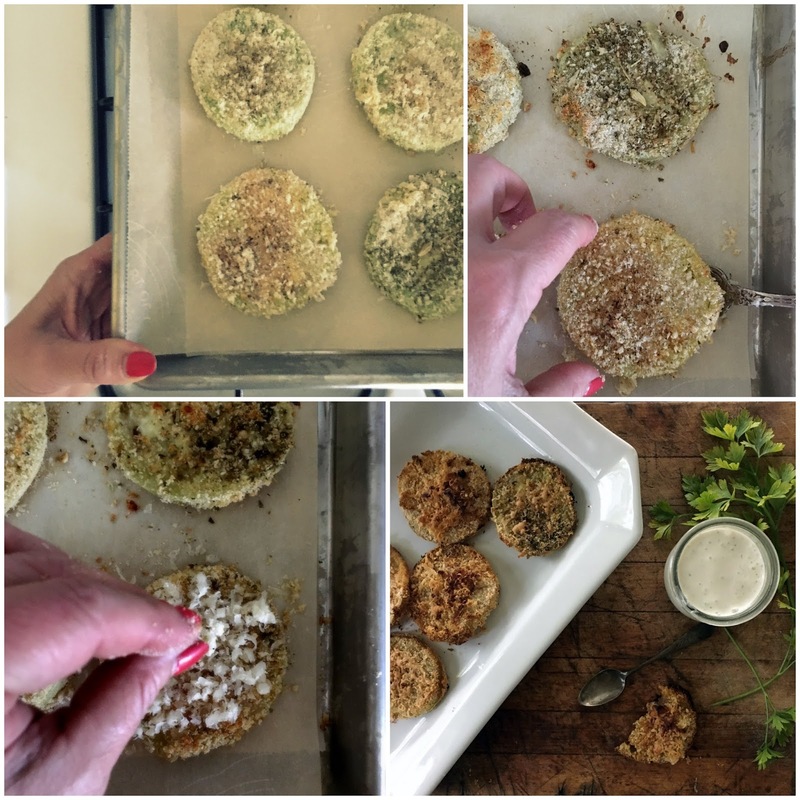 You could replicate those flavors with some dried thyme, dried parsley, grated parmigiano reggiano and lemon zest added to plain fine bread crumbs, or simply purchase seasoned bread crumbs available on store shelves and add the grated cheese to the mixture. Should you choose the lemon zest route, zest the whole lemons called for before cutting and squeezing lemons for juice. 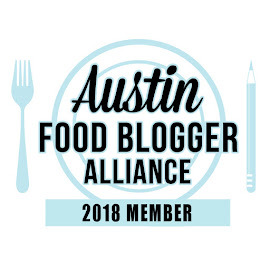 I'm happy to be hanging out with the fine farmers, vendors, staff and shoppers of the Texas Farmers' Market this weekend where I'll be demonstrating how to prepare traditional Fried Green Tomatoes. Stop by TFM Lakeline on Saturday from 10-12, and TFM Mueller on Sunday from 11-1pm to learn more, grab a bite, and shoot the breeze. I'd love to see your smiling face among the crowd.